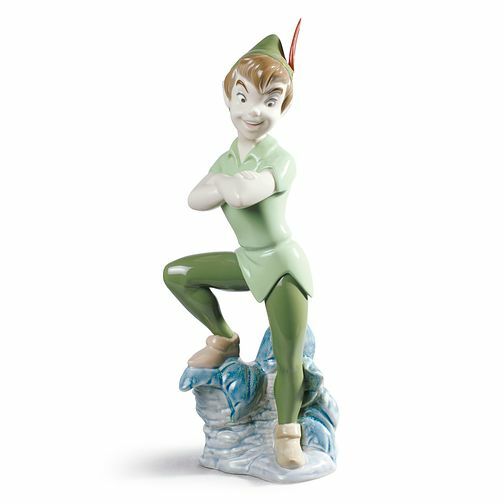 This delightful Nao porcelain figurine depicts Disney's classic character Peter Pan; the boy who never grew up, posing on a rock! Handcrafted by skilled artisans in the famous Lladro workshops of Spain, Nao figurines have an individual charm and warmth that can capture any emotion perfectly. A wonderful gift for any Disney fan. Nao Porcelain Peter Pan Figurine is rated 5.0 out of 5 by 1. Rated 5 out of 5 by Anonymous from Peter Pan Porcelain Figurine Peter Pan is my favourite Disney character, and my figurine is absolutely stunning. It sits pride of place on my mantelpiece, I love it!